New regional carrier TruJet, owned by Hyderabad-based Turbo Megha Airways Private Limited, today announced the launch of its flight services beginning Sunday (July 12) initially to Tirupati and Rajahmundry from Hyderabad while promising competitive fares on top of services like free pick-up and drop to passengers. Turbo Megha managing director Vankayalapati Umesh said the airline would mainly focus on South connecting all the state capitals with Tier II and III cities over a period of time. According to him, the firm has invested Rs 500 crore in the airline and would also be investing in a component MRO (maintenance, repair and overhaul) facility at Hyderabad international airport, which forms the hub of its operations. 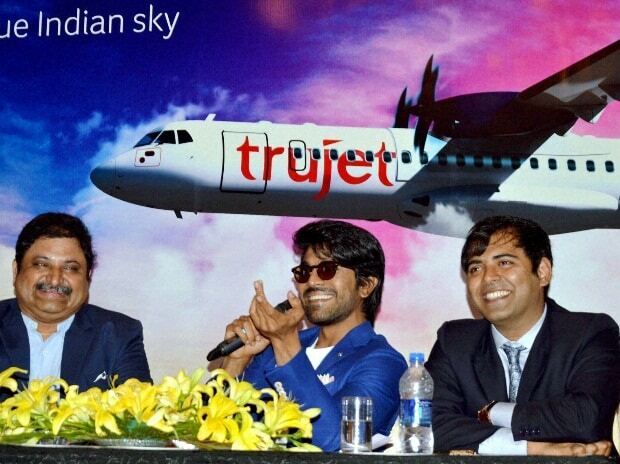 Telugu actor Konidala Ram Charan Teja, brand ambassador of TruJet and also on the board of Turbo Megha, launched the logo featuring a peacock. He also announced special discounts for people aged 60 and above, students and to south Indian movie artists. The company would operate five ATR72-500 aircraft leased from an Irish company. While it already has two, the remaining three are on their way to Hyderabad, according to Umesh. It announced basic fares as low as Rs 1,499 on certain routes and also free meal on all the routes. With the entry of TruJet, the competition seems setting in on routes connecting Tier II destinations like Rajahmundry and Tirupati. Two-year-old Vijayawada-based Air Costa yesterday announced discounts on all its routes, including Tirupati. Alliance Air, the wholly-owned subsidiary of Air India, yesterday announced the launch of flight services to Vijayawada and Rajahmundry for ‘Godavari Maha Pushkaralu’. A spokesperson of Air Costa, however, said the discounts had got nothing to do with the entry of new players. “Except Tirupati, we are not operating flights to any Tier III cities the new players are going to be present,” the spokesperson said. TruJet will run additional season special flights on Hyderabad-Rajahmundry-Hyderabad and Chennai-Rajahmundry-Chennai routes from July 15-25. Regular schedule will begin from July 26 along with the launch of another sector Hyderabad-Aurangabad-Hyderabad as the location is the nearest airport to Shirdi. It will be the only airline to offer same-plane connectivity between Tirupati and Aurangabad, according to Turbo Megha officials. Prem Kumar, director of Turbo Megha, said in 4-5 months the airline was expect to achieve 75-80 per cent load factor across all its routes and a business break even in three to three-and-a-half years.